Turbo 4.0 HD-TVI is the new standard for analog cameras and recorders. You can display up to 5MP images using this recorder and coaxial cabling. The recorder can also receive AHD cameras and old uncompressed analog cameras outside HD-TVI cameras. This recorder belongs to the Turbo 4.0 line. Turbo 4.0 cameras and recorders can bridge distances up to 1200 meters (over RG6) in 720P image quality without image loss! 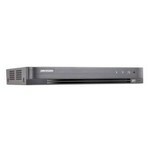 DS-7216HUHI-K2, 16 channel 4K DVR Turbo 4.0 is toegevoegd aan uw winkelwagen!